A JASIL senior researcher: Dr. Hijaba Ykhanbai said - "The last disastrous dzud of 2009-2010 is still fresh in the memories of most Mongolians. Herders all together, lost a calculated 9 million livestock worth several hundreds of millions of US dollars. Many households lost up to 80% of their animals, and just become as poor rural families. These losses could have been easily prevented had their been technology to get the severe weather forecast data across to those vulnerable populations in a timely and effective manner." 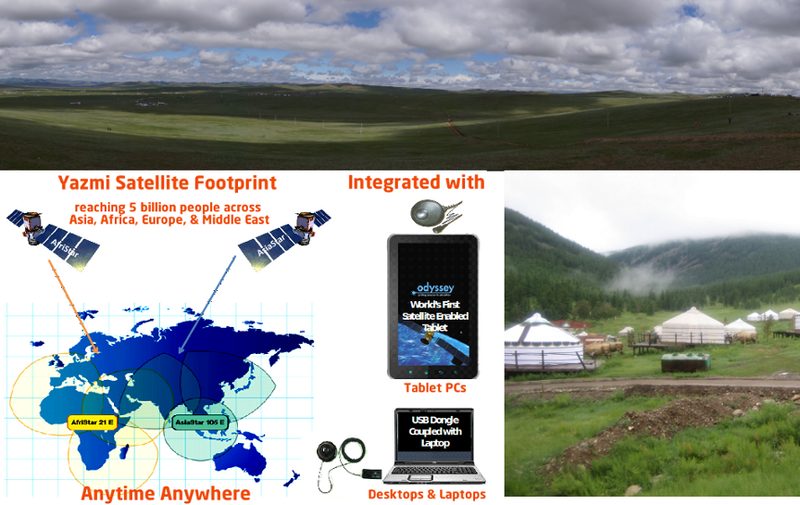 Yazmi, Spot-On, and Omin-Sat in partnership with JASIL intends to introduce sustainable satellite-enabled technologies that server a dual purpose - one that is integrated in to the Herders' daily lives as well as one that can effectively communicate live-saving crisis information. The quality, affordable, ubiquitous miniature satellite receivers are portable and easy to maintain. It requires very little power that simply feeds from the Tablet-PC through a simple USB connection. The Tablet-PC batteries can be easily powered through solar cells or small wind turbines. The use of Yazmi Alert Sending over Satellite Enabled Tablets (ASSET) concept was presented at the JASIL hoster workshop on "ICTs for sharing Weather Forecast Data with Mongolian Herders". The greatest challenge JASIL face is in getting, both human and animal, life-saving severe weather data to sparsely scattered thinly populated nomadic agriculture communities in Mongolia. That is where ASSET, unconstrained communications coverage can serve the information needs with data beamed to targeted populations any-time any-where. Dream-IT-JASIL is an innovation that investigated the use of cellular technology coupled with micro-weather stations for accumulating climate data. However, the innovation falls short with the much needed downstream (or return path) leg of communicating the detected adverse events from the accumulated micro-station supplied weather data. We will complement the system with the low-cost ASSET technology for disseminating text, audio, and video content; namely, real-time weather maps, preparedness instructions, response instructions to better serve the Mongolian needs.